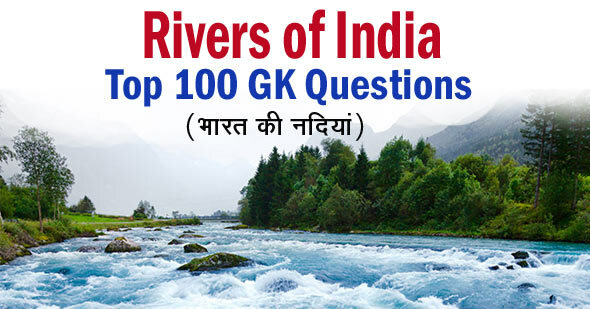 100+ MCQs Questions on Rivers of India: Dear aspirants, We are presenting you a 50 GK Questions based on the Rivers of India. In this Objective Questions on Indian Rivers we have selected only those questions which are already being asked in several exams and further may be asked in the upcoming exams. So try this quiz and evaluate your preparation for the upcoming exams. 1. Of which rivers system does the Koyna river form a part? 2. With which one of the following rivers does Chambal river merge? 3. Which is the largest of the peninsular rivers? 4. The Baglihar Hydropower Project, very frequently in the news, is located on which one of the following rivers? 6. Recently Uttar Pradesh and Madhya Pradesh Governments signed a Memorandum of Understanding for the linking of two rivers as a link project. Which are these two rivers? 7. Which of the following rivers has the largest catchment areas? 8. Which one of the following rivers originates at Amarkantak? 10. Through which one among the following groups of states does the river Narmada flow? 13. Which one of the following rivers flows into the Arabian Sea? 14. Which one of the following states has built the famous Gandhi Sagar across the Chambal river? 15. Which one of the following rivers originates in Brahmagiri range of Western Ghats? 16. In the Cauvery river water dispute, which one of the following groups of states is concerned? 17. Which one of the following rivers flows between the Vindhya Range and the Satpura Range of mountains? 19. Which one is the correct sequence of the following topographical features found from upper to lower course of a river? 20. At which one of the following places do the rivers Alaknanda and Bhagirathi merge to form Ganga? 22. The reservoir GB Pant Sagar is located on which river? 23. River Luni originates near Pushkar and drains into which one of the following? 25. Which of the following three rivers of Peninsular India have the Amarkantak region as their source? 26. The city of Nasik is situated on the banks of which one of the following rivers? 27. Which is the largest river in south India? 28. Which one of the following places is not located on the banks of river Ganga? 31. Which is the correct arrangement of the following rivers from North to South? 33. Which among the following is the correct sequence of rivers starting from North to South? 34. Which one among the following rivers does not flow into the Bay of Bengal? 36. Which one of the following river flows between Vindhya and Satpura ranges? 37. Amravati, Bhavani, Hemavati and Kabini are tributaries of which one of the following rivers? 38. Who is the largest river in India? 39. Which among the following statements provides the best evidence that a river is flowing through a rift valley? 40. Shimsha, Hemavati, Arkavati are the tributaries of which one of the following rivers? 41. which one of the rivers forms an estuary in India? 45. What is the correct sequence of the rivers Godavari, Mahanadi, Narmada and Tapi in the descending order of their lengths? 47. Which one of the following East flowing rivers of India has rift valley due to down warping? 49. On which one of the following rivers is located Indo-Pak Bagalihar Project?